Peer reviewed and accepted internationally as the new standard in Iridology education. Based on 35 yrs continuous clinical experience. White light ensures true iris colour. Coloured bulbs can distort perception of colour - one of the most important features of an iris assessment. Iridologists need good magnification and true colour to accurately assess the eyes. Iris Light offers superb clarity and unlike higher magnification lenses, this unit allows distance between you and your client without visual distortion at the edges of the lens. It comes in a protective pouch and needs two AA batteries (Not included). These features make the Iris Light our most popular viewer. Great value for money! Have you noticed that when you look at your eyes in the mirror, they are reversed? Use this chart to examine your own eyes in the mirror. This attractive chart was revolutionary as the first chart to combine both American and European iridology philosophies. Fast becoming one of the world’s most popular charts for its accuracy and ease of use: Available in English. Full colour, double sided with a protective glazed finish. Size: 18 X 13 cm (7 x 5 inches) – folds to 9 x 13 cm (3.5 X 5 inches). These plug and play presentations are useful for personal education or for explaining what an Iridologist looks for when assessing the iris. Click thru feature makes you the expert! Ideal for in-clinic promotion to demonstrate the practicality of Iridology assessment; or use the auto-run feature to play these cds in your waiting area. PC Compatible. Cardio vascular disease is the number one cause of death in the Western world. Although dietary factors come into this, it has been established that there are a number of other influences that increase risk factors. This software presents a fascinating insight into body signs indicating increased cardio vascular risk. When these body markings or the high risk emotional temperament are seen in conjunction with signs in the eye, you have the ability to turn a person's health prognosis into a more favourable outcome. Over 120 slides including excellent eye photos, images and case histories. PC and Mac compatible. Good digestion is foundational to optimum health. Today nutritional deficiency is alarmingly common. This title contains some new information with seventy five slides including photos of iris and sclera signs with case histories and some emotional precursors. You have heard the expression 'you make me sick to my stomach' - could this affect the way a person handles his food? Learn how the iris differentiates between whether a person has difficulty digesting and absorbing proteins, fats, carbohydrates or minerals. Making you more effective in your treatment protocols. PC and Mac compatible. Today we have a pandemic of Dysglycaemia. Late onset diabetes has been renamed Type 2 diabetes due to the fact that this malady has no preference as to the age of its victims. We have seen in the last decade in particular, more and more youths falling prey to it. This program explains the signs seen in the eye, on the body and also in the emotional temperament that increases the risk of pancreatic dysfunction. PC compatible. The kidney reaction field is the most common area for irregularities in the structure of the iris. Kidney issues discussed in this program range from dehydration to stones and even cancer. This program explains the signs seen in the eye, on the body and also in the emotional temperament that increases the risk of renal dysfunction. PC compatible. The endocrine system includes all of the glands of the body and the hormones produced by those glands. The glands are controlled directly by stimulation from the nervous system as well as by chemical receptors in the blood and hormones produced by other glands. By regulating the functions of organs in the body, these glands help to maintain the body’s homeostasis. Cellular metabolism, reproduction, sexual development, sugar and mineral homeostasis, heart rate, and digestion are among the many processes regulated by the actions of hormones. Learn to identify potential glandular issues from the eye. PC and Mac compatible. 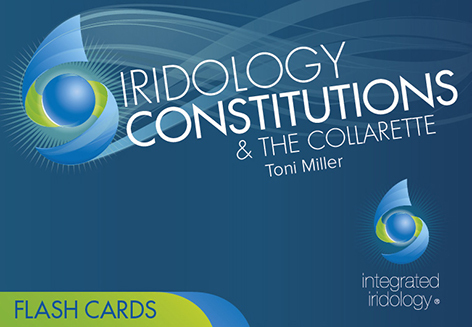 Increase your Iridology knowledge with a program that adds to your bottom line! Most clients want something they can read. Print take home information sheets instantly. How does this program not only pay for itself but add to your bottom line? All sections can be selected and inserted into a Report at the click of your mouse. The information is written in friendly terminology designed to enhance your ability to explain Iridology, providing a tool that produces a valuable resource - a professional report to meet the individual needs of your clients. Most practitioners charge the equivalent of a first consultation for this optional extra. AND.....You can customize the report template with your details! First released in 1998, this is the third revision and still remains the best value for money iridology data software available. 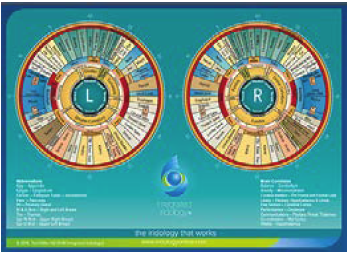 The Iridologist Report is based on Integrated Iridology®. This is an ideal resource for self-education or for explaining various signs in the iris to your clients. This is a superb work ideal for producing professional reports using the editable template included. (Microsoft Word based). Suitable for PCs.